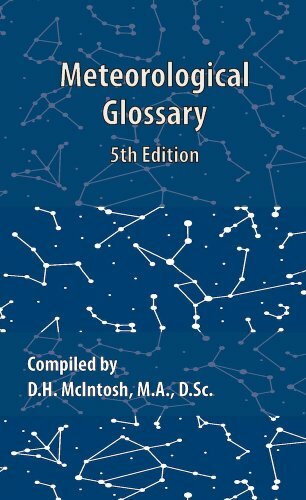 PREFACE TO THE FIFTH EDITION When, in 1967, the Meteorological glossary came under consideration for reprinting, it was decided to ask Dr McIntosh to undertake a revised edition, with cooperation from within the Meteorological Office. The opportunity has been taken in this edition, to delete some terms which are considered no longer appropriate, and to include various new entries and revisions which stem from recent advances and practice. Units of the Systeme International have been adopted in this edition. In some cases, however, the traditional British or metric units are also included because of existing World Meteorological Organization recommendations and for the convenience of user interests during the period before complete national and international adoption of SI units. Meteorological Office, 1970. PREFACE TO THE FOURTH EDITION In 1916, during the directorship of Sir Napier Shaw, the Meteorological Office published two pocket-size companion volumes, the 'Weather map' to explain how weather maps were prepared and used by the forecasters, and the 'Meteorological glossary' to explain the technical meteorological terms then employed. With the advance of the science and the elaboration of its techniques the publications have been in continuous demand, many times reprinted and on several occasions completely revised. The second edition was in 1930, the third in 1938-39, and soon after World War II it was obvious that radical revision was necessary once again. In 1956 the fourth edition of the 'Weather map' was issued but, for the first time in forty years, it was not found possible to prepare simultaneously a new edition of the 'Meteorological glossary' which had become very much out-of-date and in need of a complete remodeling. For earlier editions the task had been shared amongst the professional staff of the Office and the result was an interesting and up-to-date volume containing much useful information, although the freedom allowed to the many contributors had led to a unique volume of quite uneven character with articles varying from brief dictionary definitions to encyclopedic essays. For the fourth edition the number of new entries was to be larger than ever before and it was decided that the need was now for a more systematic reference work containing a brief definition of all the terms in ordinary use rather than for a compilation of miscellaneous articles giving information which would more properly be looked for in one of the many modern textbooks. For this purpose a single author, assisted if need be by expert referees, would, it seemed, be advantageous and the Office was fortunate in finding in Dr D. H. McIntosh of the University of Edinburgh a physicist and meteorologist of wide experience willing to undertake the major task. Before being passed for printing every article has been read critically by more than one member of the scientific staff of the Office and Dr. McIntosh has shown a remarkable readiness to compromise. In this way it is hoped that the excellence of the author's original draft has been fully retained while providing a work which will adequately meet the needs of the official service. It would, however, be too much to hope that no further improvement will be possible and the Office will be pleased to receive from any source criticisms and suggestions calculated to increase the value of the work, not only for the professional meteorologist, but for interested people everywhere. Meteorological Office, 1962. For more than 30 years we have operated as a warehouse/mail order operation.